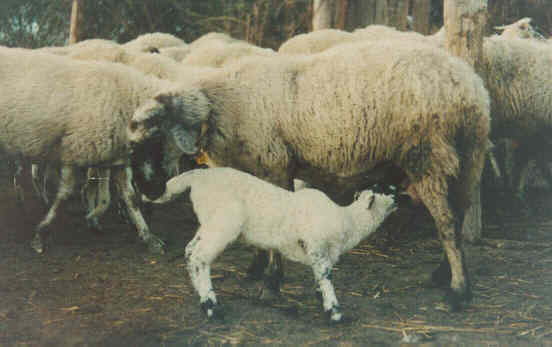 The Bagnolese Sheep is an autochthonous breed from Campania that got its name from the village of Bagnoli Irpino in the province of Avellino. It probably derives from the crossbreeding of the Barbaresca breed and the local breeds of the Apennines. Over time it spread from Irpinia to the entire region up to the provinces of Caserta and Salerno. Today there are about a thousand exemplars in the zone of the plateau of Laceno so that, strictly speaking, it cannot really be considered endangered of extinction, yet still this truly interesting breed deserves to be valorized considering the excellent quality of the dairy products derived from its milk: pecorino as well as ricotta cheese (fresh or salted and aged). In Irpinia (province of Avellino) these sheep are still largely kept in wild or semi wild state, fed on herbal pastureland with integration only in the winter months. White coat with black spots small or large.